Slide Animations are applied to the slide’s main background image (or video poster/cover) when the slide appears into view. Represents the number of “pieces” the image is divided into for these animations. 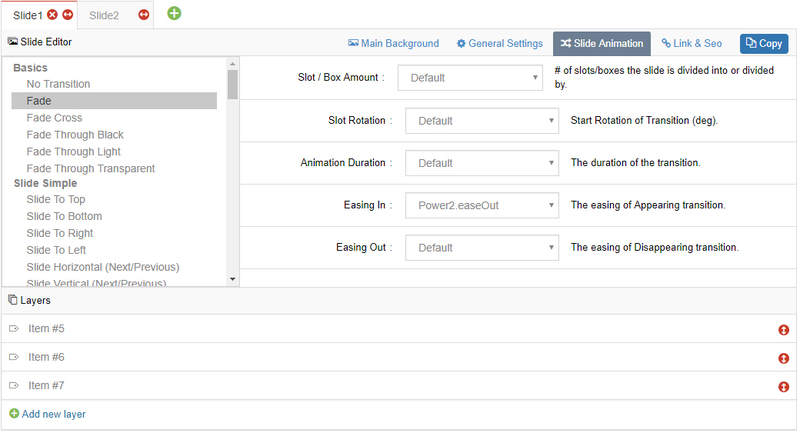 Applies a starting rotation to the slot-based animation. How long the animation will last from start to finish in milliseconds (1000 = 1 second). Easing In: The easing applied when the background animates into view. Easing Out: The easing applied when the background animates out of view (on slide change).